★ Sleek and Compact: One of the smallest and lightest little charger. 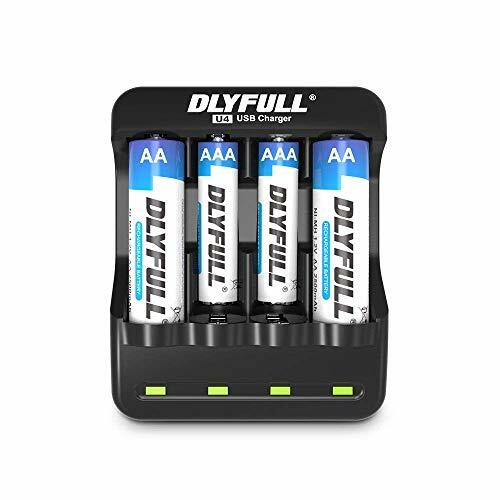 Suitable for 1/2/3/4 AA AAA Ni-MH Ni-CD rechargeable batteries. Charging independently or simultaneously is allowed. ★ Superior Safety: Advanced MCU system control combines Minus delta voltage protection, over-voltage, over-current & over-heat prevention to keep you and your devices safe. ★ Travel Ready: Ultra-compact with optimal portability in mind & equipped with international voltage(USB Cable) compatibility, ideal for traveling anywhere in the world. ★ Premium Design: The robust matte finish resists scuffing and scratches. The four smart LED indicators show charging status automatically. ★ What You Get: Dlyfull smart battery charger, USB cable, welcome guide, & our worry-free 18-month warranty and friendly customer service. Decent charger for its price! Love having this charger for my batteries!!! Junk. Says comes with batteries, IT DOESNT!